From 15th to 17th November, at Kuala Lumpur Convention Centre, Malaysia will be held the biennial event the Malaysian Palm Oil Board International Palm Oil Congress (PIPOC 2011). 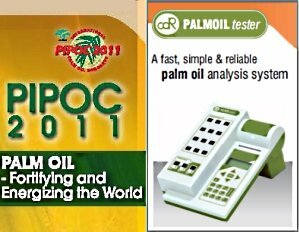 In PIPOC 2011, CDR PalmOilTester, analyzer for crude and refined palm oil, will be presented by its Malaysian distributor PLT Scientific Sdn Bhd at stand number 91. PIPOC 2011 themed “Palm Oil – Fortifying and Energizing the World” will focus on palm oil as the powerhouse in the oils and fats market and advances in the industry, including the need to balance its growth in harmony with the environment for sustainable development. Featuring five concurrent conferences covering the upstream, midstream, downstream, economics and marketing, PIPOC provides a strategic platform for interaction and in-depth deliberation of the many facets of oil palm and the palm oil industry from innovations, challenges and the latest developments. A trade exhibition will be held throughout the Congress to provide opportunity for delegates to view and discuss current technology, state-of-art equipment and products related to the oils and fats industry as well as to provide networking opportunities for buyers and sellers. CDr PalmOilTester palm oil analyzer at PIPOC 2011 was last modified: May 25th, 2017 by CDR s.r.l.